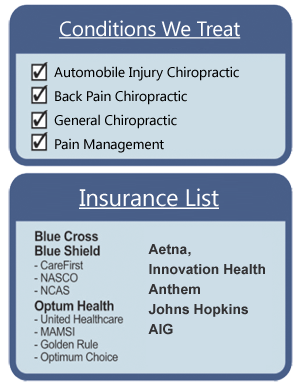 Many people who have been in an automobile accident seek chiropractic treatment. Furthermore, in the cases where the accident leads to a trial against the other party, chiropractic evaluation and diagnosis can play an important role as evidence in a court of law. After an auto accident the most common area for pain and problems is the neck. If the problem goes untreated, it can interfere with everyday life, where you cannot move freely, and could lead to a permanent disability. After an auto accident, damage can occur in many areas such as the 24 vertebrae, 32 joints, and the overlapping muscles and ligaments located in other areas of the body. Some after effect symptoms can include dizziness, nausea, vomiting, ringing in your ears, muscle stiffness and pain. The most common injury occurs in the neck. This is due to the sudden movement of your neck when it bends backward then forward. State of the art equipment like a CT or MRI scan might not show all the extensive injuries to the upper body and if left untreated for a long time, it could become a chronic pain. If you are injured in an auto accident, the sudden injury to your spinal bones causes damage to the spinal nerves and this leads to displacement in the neck, which could form deformation or lead to muscle atrophy. If there is damage to the nervous system, symptoms such as dizziness can occur. Chiropractic treatment has been reported to be highly effective in treating injuries due to automobile accident cases. Through chiropractic treatment, the spinal bones will be guided back into the proper alignment, and then proper rehabilitative exercise will help muscles heal and strengthen, and accelerate the body to regain balance. If you are experiencing pain from an automobile accident, we recommend you receive chiropractic treatment. The impact of an auto accident has a tremendous effect on the body. The injuries that occur to the body are different depending on each patient and their posture before the accident. Immediately after the accident, the shock that is felt is different. Immediately after the accident, pain is not typically felt, the body protect itself from shock, but the day after is when patients begin to feel pain from shock. The surrounding muscles fibers are under excessive tension, and increasing pressure to the surrounding nerves and swelling causes pain. This pain is usually felt between 2-6 weeks, and pain killers can be prescribed according to pain levels. Damage to the muscles in such cases as an auto accident, are one of the most common types of injury and pain may subside as time passes. However, the problem is that symptoms may reoccur suddenly for no particular reason, this is a typical case of the aftereffect or sequelae of an automobile accident. The type of injury is directly related to the posture of the driver, and how they were seated during the accident. When a car is rear-ended in the case where the driver is facing forward, the injury is referred to as a "whiplash" injury, where the neck suddenly thrusts forward then back. In the event of a car accident with the driver with their seat belt on, on impact, the body is stationary and only their head, which can weigh up to 15 pounds is subject to the whiplash injury. This results in injury to the cervical spine and surrounding ligaments and muscles. Pain from muscle damage can subside fairly quickly and many people go without further treatment; however, without complete treatment, pressure can continuously build on the spine and if left alone, other neurological symptoms such as shoulder pain, numbness of the hands, and headaches may occur. In addition to the neck and the upper body injuries, other injuries can also occur in the lower body when lap portion of the seat belt is worn during the automobile accident. The area where he most shock is felt in the lower body is the fifth lumbar vertebra. This will also lead to damage to the disk and surrounding area such as the pelvic joints. Without proper treatment for long periods of time, distortion of the pelvis and lumbar vertebra can produce neurological symptoms such as radiating pain down the low back, the buttocks and legs, numbness and weakness. Actually an aftereffect or a sequelae may not be an "after" effect. These symptoms are just not the symptoms that the body wanted to emit at that time. If our body had the ability to display all the bodily symptoms at the same time, there may be no such thing as an aftereffect or a sequelae of an accident. It is also important to understand that the symptoms that are felt after an auto accident may not be solely due to the automobile accident. However, there may have been underlying problems or symptoms that had gone unnoticed, and due to the shock of the automobile accident, were able to be found. It is always important to meet with a doctor so that the right diagnosis can be administered.